Hot iron gas rides a wave of space-time around a black hole in this computer image taken from a Rossi X-ray Timing Explorer observation. If a pulsing star exists near the center of our Milky Way galaxy, where a giant black hole is thought to lurk, it could shed light on the workings of Albert Einstein's general theory of relativity, scientists say. The flashes of light from such a star, called a pulsar, could be used to determine how much the behemoth black hole distorts space-time around it. Unlike a standard star, pulsars emit steady pulses of light that allow their motion to be tracked precisely. 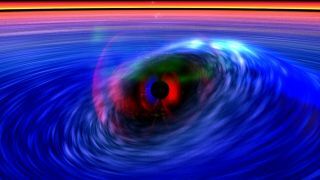 An international team of astronomers has proposed that such precision could create a better understanding of the space-time around a black hole. "We can do a thousand times better," astronomer Jim Cordes of Cornell University in New York told SPACE.com. In general relativity, Einstein combined space and time together in a single mathematical entity known as space-time, which is affected by gravity. If the flat expanse of space-time could be compared to a mattress, a massive body such as a black hole would curve it much like a person sitting in the center of the bed. "Instead of maintaining the same position in space, the ellipse is slowly rotating around," Cordes said. Astronomers could detect this motion in a star by measuring how the light waves it produces are shortened or lengthened by its movement, a process known as Doppler shift. While the Doppler shift caused by precession could be measured in any star, pulsars are better candidates to measure this motion, researchers said. Born from fiery supernova explosions, pulsars pack the mass of the sun into the area of a large city. They spin rapidly, and emit a steady lighthouse-beam of light that looks like a pulse turning on and off as the beam rotates toward and away from an observer. By measuring how the separations between the pulses change over time, astronomers can study how the pulsar has been affected by the space-time it plows through. "We can measure the arrival time of a pulse — in the case of one in the galactic center — to about a millisecond," Cordes said. "That gives us a much more precise measurement than just making Doppler shift measurements." As the pulsar's orbit evolves, scientists can use its new position to calculate the gravity around the black hole, and the mass of the giant itself. "Signals get delayed by the curvature of space-time," researchers Kuo Liu, Norbert Wex, and Michael Kramer, all of the Max Planck Institute in Germany, told SPACE.com by email. "The more delay, the closer the signal has to pass to the black hole in its way to Earth." At the same time, the black hole tugs at the space-time around it in a process known as the Lense-Thiring effect. Cordes compares this effect to submerging a basketball in a tub of water. If the ball is spun, it drags the water closest to it along with it. Water farther away feels less of an effect. Space-time feels the same tug around a pulsar. The scientists outlined their plan to study pulsars' effects on space-time in a paper published in the March edition of the Astrophysical Journal. Astronomers have yet to find a pulsar close to Sagittarius A*, the name given to the radio object thought to represent the Milky Way's central black hole. But because pulsars are a natural outcome in the evolution of massive stars, Cordes expressed confidence that plenty exist. However, the galactic center is filled with gas and dust that scatter radio waves, hiding the tiny stars from our view. "The ideal pulsar would be one that's spinning a few hundred times a second," Cordes said. "We would call that a millisecond pulsar, because its spin period would be a few milliseconds." The more frequent ticks would allow for greater precision in measuring how the pulsar is affected by the curvature of space-time. Hundreds of these special neutron stars are known to exist throughout the galaxy. Unfortunately, the gas and dust do a better job of blocking flashes from a millisecond pulsar than from a more slowly spinning star. Pulsars flashing once per second would be the second-best candidate, according to Cordes. "They are less influenced by this scatter effect," he said. In order to be useful, such a pulsar must be close to the black hole, with a period of only a few months or less. It should also be inclined from the equator of the black hole. "We really couldn't do this 10 years ago, because we didn't have sensitive enough radio telescopes, but we do now," Cordes said. Future telescopes such as the Square Kilometer Array, which will study the sky from the southern hemisphere — a perspective that will allow for a better view of the center of the galaxy — will make the search even easier in another decade, with the potential to reveal pulsars throughout the center of the galaxy. The team is confident that it's only a matter of time. "We've never measured a pulsar orbiting a black hole, so this is new territory," Cordes said. "It could have a huge payoff if we could find the right pulsars." Follow SPACE.com for the latest in space science and exploration news on Twitter @Spacedotcomand on Facebook.